Draft: 2003, Texas Rangers, 17th rd. Ian Michael Kinsler…was a teammate of Brian Anderson, Chris & Shelly Duncan, and Scott Hairston at Canyon Del Oro H.S. (AZ)...team won state titles in 1997 and 2000...First-Team All-State and First-Team All-League during his senior campaign...also named to Arizona's All-State team in soccer as a senior...attended Central Arizona College in 2001, Arizona State University in 2002 and University of Missouri in 2003...was a business communications major in college...leads up a charity called Kinsler's Kids in partnership with the Birthday Party Project, which brings joy to homeless children through the magic of birthdays, celebrated at his home ballpark...met with select graduates for the Gang Resistance Education and Training (G.R.E.A.T) in Detroit...served as the Tigers Strikeout Bullying representative in 2014 and 2015...his father, Howard, played basketball at the University of Arizona as a freshman and once worked as a prison warden. Acquired by the World Series Champion Boston Red Sox a day before the July 31 trade deadline from LAA...Won his second-career Gold Glove Award after finishing tied for first among all AL second basemen in defensive runs saved (10), second in SABR Defensive Index (8.4) and third in zone rating (.832)...In 128 games between LAA (91) and BOS (37), hit .240 (117- for-487) with 26 doubles, 14 HR, 48 RBI, 66 runs and 40 BB compared to 64 SO...Is one of three players to play 100+ games in each of the last 13 seasons since 2006 (also: Nick Markakis and Yadier Molina)...is the only player to do so in the AL...Became one of four players with 100+ hits in each of the last 13 seasons...Adrián Beltré, Nick Markakis, and Albert Pujols have also done so...is the only player with 10+ SB in each of those seasons...Is one of four players with 20+ 2B in each of the last 13 years (also: Adrián Beltré, Robinson Canó, and Nick Markakis)...Is the only player in the majors to have scored 60+ runs in each of the last 13 years...Played all 128 games at 2B in 2018, including 124 starts...finished the season ranked third among active players with 1,741 career starts at 2B (Robinson Canó, 1,991; Brandon Phillips, 1,808)...Turned 89 double plays at 2B, 2nd-most in the AL...Hit two leadoff HR, both with LAA (4/12 at KC and 6/19 vs. ARI)...his 48 career leadoff HR are the fourth-most in ML history, trailing only Rickey Henderson (81), Alfonso Soriano (54), and Craig Biggio (53)...Made his season debut in the LAA's second game on 3/30 at OAK and was placed on the 10-day DL the following day with a left adductor strain...Returned from the DL on 4/12 and hit his 47th career leadoff HR in his first at-bat that day at KC...hit his 48th career leadoff HR on 6/19 vs. ARI...Hit six HR over an 11-game span from 5/29-6/9, batting .356 with 10 runs, four 2B, 11 RBI, and an .844 SLG in that time...Homered in consecutive games on 6/1-2 vs. TEX, his former club...From 6/6-9, homered in three straight games...became the first LAA 2B to homer in three straight games since Howie Kendrick in 2011...Hit game-winning HR on 6/8 & 6/9 at MIN...marked the first time in his career he hit go-ahead HR on consecutive days...In his final 50 games of the season (beginning 7/12), hit .289 (52-for-180) with 11 doubles, three HR, 25 RBI and 30 runs...hit .328 (41-for-125) with a .384 OBP vs. RHP...Acquired by BOS on 7/30 and made his team debut on 7/31 vs. PHI...In his second game with BOS on 8/2 vs. NYY, went 3-for-6 with two runs, a double and two RBI...scored his 1,200th career run...Missed time on the 10-day DL with a left hamstring strain from 8/4-16...Recorded his 400th career double as part of the Sox' 11-run 7th inning on 8/29 vs. MIA...hit an RBI single later in the inning...became one of 11 active hitters with 400+ 2B...Appeared in 11 of BOS' 14 postseason games during their World Series run and made eight starts at 2B...hit .206 (7-for-34) with three doubles, three RBI and four runs scored. Completed 12th big league season, fourth with Tigers...90 runs scored ranked fourth in the A.L. by a second baseman while 22 homers ranked sixth ... One of just five second basemen in the Majors to log 20 home runs, 25 doubles and 90 runs scored: Jose Altuve, Brian Dozier, Daniel Murphy and Jonathan Schoop ... Marked the fi \fth ti \me tallying a 20 HR/25 2B season, which ranks third all-time by an American League second baseman: Robinson Cano (8 seasons) and Joe Gordon (6) ... Posted a .983 fi elding percentage and committed just 10 errors...Led American League second basemen with six defensive runs saved and a 6.1 UZR. Played in 150-or-more games for the third straight season, appearing in 153 games in 2016... Won the American League Gold Glove as a second baseman -- posted a .988 fielding percentage, committing just nine errors in 744 total chances...led all AL second baseman with a 5.09 range factor per nine innings, while he was tied for first among AL second basemen with 12 defensive runs saved, second with 303 putouts and 432 assists and fifth with a .988 fielding percentage... Named the Detroit Tigers 2016 Heart and Hustle Award winner by the Major League Baseball Players Alumni Association. Ranked fourth in the American League with 117 runs scored and tied for seventh with 55 multi-hit games... Established a franchise single-season record with eight leadoff home runs, besting the previous record of seven, set by Curtis Granderson in 2007 and 2009…now has 40 leadoff homers in his career, which is the seventh-most in MLB history...Finished the season with 28 homers, which were tied with Lou Whitaker (1989) for the most homers in a season by a Tigers second baseman -- hit 25-or-more homers for the third time in his career (also, 2009 and 2011 with Texas)... Scored 117 runs, marking the sixth time in his career he has scored 100-or-more runs in a season... Went 3x6 with two runs scored, a home run and four RBI on Opening Day at Miami -- his four RBI were the most by a Tiger in a season opener since Dmitri Young had five RBI on April 4, 2005 vs. Kansas City... Recorded multiple hits in each of the first three games of the season, becoming the first Tiger to have two-or-more hits in the first three games of the season since 2010 when Miguel Cabrera and Magglio Ordoñez did so... Hit safely in 10 straight games from April 12-22 -- batted .364 (16x44) with nine runs scored, two doubles, three home runs and seven RBI during the streak... Recorded the 200th stolen base of his major league career on May 6 vs. Texas...Homered in a career-high four straight games from May 15-18 -- according to the Elias Sports Bureau, he became the first player in Tigers history to homer from the leadoff spot in four straight games... Posted his second 10-game hitting streak of the season from May 12-22 -- hit .390 (16x41) with 13 runs scored, three doubles, four home runs and seven RBI during the streak... Hit the first grand slam of his major league career on May 31 at Los Angeles (AL)... Collected an RBI double as a pinch hitter on June 2 vs. New York (AL)…marked his first career hit as a pinch hitter... Hit a walkoff RBI single in the bottom of the 10th inning on June 7 vs. Toronto -- was his eighth career walkoff hit and his sixth since joining the Tigers... Established a career high with five RBI on June 11 vs. New York (AL), hitting a double and a three-run homer... Scored the 1,000th run of his major league career in the first inning on June 18 at Kansas City... Hit the 200th home run of his major league career on July 3 at Tampa Bay, blasting a two-run homer off of Danny Farquhar in the ninth inning -- became the 40th player in MLB history with 200-or-more career home runs, 1000-or-more career runs scored, 1,600-or-more career hits and 200-or-more career stolen bases…also became the seventh-fastest player to reach those numbers, trailing Willie Mays, Bobby Bonds, Barry Bonds, Alex Rodriguez, Larry Walker and Carlos Beltran... Belted his 25th homer of the season on September 3 at Kansas City -- marked the third time in his career he has hit 25-or-more homers in a season... Posted his first four-hit game of the season and the 18th of his career on September 14 vs. Minnesota... Batted .309 (50x162) against lefthanded pitchers…hit .281 (128x456) vs. righties... Posted a .309 (95x307) batting average at Comerica Park…batted .267 (83x311) on the road... Hit .289 (103x356) with 71 runs scored, 17 doubles, three triples, 16 home runs and 52 RBI in 86 games prior to the All-Star break…batted .286 (75x262) with 46 runs scored, 12 doubles, one triple, 12 home runs and 31 RBI in 67 games after the All-Star break. Completed his second season with the Tigers in 2015, playing in 154 games. Named the best defensive second baseman in the majors by Fielding Bible. Selected as one of three finalists for the Rawlings Gold Glove at second base. Led the majors with 61 multi-hit games, while he finished tied for first with six games of four-or-more hits. Ranked fourth in the American League with 185 hits, while he was tied for 10th with 94 runs scored and 12th with a .296 batting average. Hit the 300th double of his major league career on May 20 vs. Milwaukee and became the 40th second baseman in major league history to hit 300 career doubles. Belted a leadoff home run on July 9 at Minnesota -- marked the 32nd leadoff home run of his career. Hit a pair of home runs on July 20 vs. Seattle -- the performance was Kinsler's 13th career multi-homer game and his first since September 7, 2011 at Tampa Bay. Hit .366 (41-for-112) with 16 runs scored, nine doubles, two triples, three home runs and 15 RBI in 27 games during the month of July...his .366 batting average in July ranked eighth in the AL. Recorded three straight three-hit games from July 30-August 1 -- marked the second time in his career and first time since June 27-29, 2008 that he has had three straight games with at least three hits. Hit a walkoff two-run home run on August 6 vs. Kansas City...also recorded walkoff homer on September 19 vs. Kansas City -- according to the Elias Sports Bureau, Kinsler is the third Tigers player to hit two walkoff homers against one team in a single season. Went 5-for-5 with three runs scored, a double, a home run and two RBI on August 18 at the Chicago Cubs...the performance marked his third career five-hit game and his first since April 15, 2009 vs. Baltimore. Had a season-long, eight-game hitting streak from August 18-26 and hit .457 (16-for-35) with nine runs scored, three doubles, two triples, two home runs and six RBI during the streak. Named Tigers Player of the Month for August after hitting .362 (38-for-105) with 22 runs scored, seven doubles, three triples, four home runs and 15 RBI -- ranked fifth in the AL in hits during August, while he was seventh in runs scored and eighth in batting average. Recorded the 1,500th hit of his major league career on September 10 at Cleveland with a RBI single in the seventh inning, becoming the 77th second baseman in MLB history to reach the 1,500-hit mark. Hit .305 (40-for-131) against lefthanded pitchers...batted .294 (145-for-493) with righthanders on the mound. Batted .297 (94-for-317) in 79 games at Comerica Park...hit .296 (91-for-307) on the road, which ranked ninth in the American League. Posted a .305 (32-for-105) batting average in close and late situations. Hit .274 (95-for-347) with 50 runs scored, 20 doubles, three triples, three home runs and 39 RBI before the All-Star break...batted .325 (90-for-277) with 44 runs scored, 15 doubles, four triples, eight home runs and 34 RBI following the All-Star break -- ranked seventh in the AL with 90 hits after the All-Star break. Established career highs in games played (161), hits (188) and RBI (92) as he completed his first season with the Tigers in 2014...Selected to the American League All-Star squad for the fourth time in his career, first with the Tigers...Finished the season third in the American League with 161 games played, while he was tied for fourth with 188 hits and 40 doubles, fifth with 100 runs scored, and tied for fifth with 55 multi-hit games...Fanned once every 9.19 plate appearances -- the 10th toughest batter to strike out in the American League...Finished third among all American League second basemen with a .988 fielding percentage (766TC/9e)...Scored 100 runs on the season for the fifth time in his career...One of just seven players in the American League to post at least 15 home runs and 15 stolen bases on the season...Connected for a walk-off single on April 2 versus Kansas City -- the third walk-off hit of his career...Matched a career high with four rBI on April 17 versus Cleveland...Posted a season-high 11-game hitting streak May 14-25 -- batted .400 (20x50) with 10 runs scored, eight doubles and three RBI during the streak...Collected a season-best four hits on May 18 at Boston's Fenway Park...Matched a career high with three doubles in a game on May 23 versus Texas...Batted .331 (40x121) with 22 runs scored, 13 doubles, two home runs and nine RBI in 28 games during May -- tied for first with 13 doubles, while he was fourth with 22 runs scored during the month...Hit .303 (33x109) with 17 runs scored, six doubles, two triples, six home runs and 19 rBI in 27 games during June...Connected for a lead-off home run on August 22 at Minnesota and on August 30 at Chicago's u.s. Cellular Field -- has 12 home runs to begin a game in his career...Batted .322 (55x171) with runners in scoring position...Posted a .281 (48x171) batting average with four home runs and 22 RBI against lefthanded pitchers...batted .273 (140x546) with 13 home runs and 70 RBI with righties on the mound...Hit .265 (87x328) in 81 games at Comerica Park... batted .284 (101x356) in 80 games on the road. Completed his eighth full season at the major league level, appearing in 136 games in 2013 for the Texas Rangers...Fanned once every 10.4 plate appearances, the third-toughest batter to strike out in the American League...Ranked as the sixth-toughest batter to double up in the American League (109.0 AB/1GDP)...Hit 13 home runs on the season to mark his seventh year with 10-or-more home runs -- hit leadoff home runs on May 4 versus Boston and September 17 at Tampa Bay... is now tied for fifth among active players in leadoff home runs...Batted .237 (32x98) with six doubles, five home runs and 16 RBI in 24 games during April -- ranked 11th in the American League during that stretch...Had a season-high four RBI on April 7 versus Los Angeles Angels -- equaled the high July 8 at Baltimore and July 26 at Cleveland...Posted a season-high 11-game hit streak April 24-May 5...Sidelined May 18-June 14 with a right intercostal strain...Assigned to Double A Frisco for an injury rehabilitation assignment on June 13 -- went 0x8 with a walk in two games...Reached base safely in 17 games from August 12-31...Hit his first career inside the park home run on August 23 at Chicago's U.S. Cellular Field...Clubbed a season-high four hits on August 27 at Seattle...Batted .311 (124x399) during night games...hit .185 (27x146) during the day...Ranked last in the American League (among qualifying players) with a .978 fielding percentage (13Ex595TC)...Hit .306 (48x157) against lefties...batted .265 (103x388) with righthanded pitchers on the mound...Posted a .292 (76x260) average at home...batted .263 (75x285) on the road. Was among the A.L. leaders in at bats (3rd, 655), runs (T3rd, 105), doubles (6th, 42), hit by pitches (T8th, 10), extra-base hits (T10th, 66), and multi-hit games (12th, 52)...led the Rangers in at bats and runs, tied for 1st in walks (60) and steals (21), was 2nd in doubles and triples (5), placed 3rd in games (157) and total bases (277), and ranked 4th in hits (168), extra base hits, and RBI (72)...set career bests for games, at bats, hits, doubles, triples, and strikeouts (90)...had career lows for on-base percentage (.326) and OPS (.749)...started 144 games at 2nd base and 13 as the DH...batted exclusively in the leadoff spot, setting club records for most games and at bats in that position...overall had the 9th most at bats in team history...became the 6th Ranger with multiple 40+ doubles seasons, joining Michael Young (3), Rusty Greer (3), Rafael Palmeiro (2), Ivan Rodriguez (2), and Mark Teixeira (2)...was 2nd most 2B ever in a season for a Rangers' leadoff hitter...BATTING: His .256 batting average was the lowest among the 7 Rangers who qualified for the batting title...has a .256 (326-1275) average over the last 2 seasons after entering 2011 with a .281 career mark...batted .328 (19-58) in 1st 14 games before hitting .230 (20-87) in 20 games from April 21(G2)-May 12 to drop to .269...had .286 (85-297) average from May 13-August 4 to sit at .281, highest it would be the rest of the year...beginning Aug. 6, hit .207 (44-213) in final 53 contests, 7th lowest among A.L. qualifiers in that span...had an 0-for-21 skid from Aug. 12-19, 2nd-longest drought of his career (0-for-24, June 30-July 6, 2009)...reached safely via hit, walk, or hit by pitch in 127 of 157 games...had the A.L. 's 2nd best average versus left-handers at .350, the 6th best ever in team history (min. 125 PA vs. LHP)...batted just .226 against right-handers, 8th lowest in the league and the 5th lowest among qualifiers in club history, smallest figure since Dean Palmer (.221) in 1992...had the A.L. 's 9th lowest road average at .220 and .217 (139-640) away figure in 2011-12 is 2nd lowest in the majors (min. 500 road AB) to Cincinnati's Drew Stubbs (.216)... had a .375 (9-24) average with RISP through May 10(G1), but batted .193 (21-109) with RISP the rest of the way to finish at .226...was 6-for-17 (.353) with 14 RBI with the bases loaded...had season-high 4 hits twice: June 28 vs. OAK and July 8 vs. MIN...longest hit streak was 8 games, Aug. 19-26...longest on-base streak was 13 games, June 15-28...Had season-high 4 RBI twice, tying career high (8 times): May 27 vs. TOR and Aug. 25 vs. MIN...only HR/RBI in final 15 games was a leadoff blast on Sept. 27 vs. OAK...singled and tripled in the 1st inning, April 21 (day) at DET...had a leadoff HR and 3-run triple on Aug. 25 vs. MIN, just the 3rd time that had been accomplished in the same game in the last 50 seasons: Brewers' Paul Molitor on 9/23/91 vs. NYYand Braves' Rico Carty on 8/27/64 vs. SF, both at Milwaukee's County Stadium (Elias Sports Bureau)...had 33 multi-hit games in 1st 75 contests through June 28, then had 19 in his final 82 contests beginning June 29...beginning June 3, Rangers had a 30-1 record when Kinsler had 2+ hits... after recording just 18 strikeouts in his 1st 38 games (9.1 AB/SO ratio), fanned 4 times for the first time in his ML career on May 18 at HOU, and had 72 K's his final 119 contests (6.8 AB/SO ratio)...was ejected 3 times, most of any player in 2012: June 14 vs. ARI, June 24 vs. COL, and August 15 at NYY...batted .222 (12-54) with 3 HR and 10 RBI as the DH. Scored the 2nd most runs in the A.L. (121) and placedamong the league leaders in walks (5th, 89), homers (T5th, 32),extra base hits (T9th, 70), stolen bases (T9th, 30), and at bats(10th, 620)...topped the Rangers in runs, extra base hits (70), andwalks, tied for 1st in homers, placed 2nd in games (155), at bats,doubles (34), total bases (296), and steals, and was 3rd in hits(158), triples (4), and on-base percentage (.355)...established career highs in games, at bats, runs, home runs, total bases (296),and walks...his .832 OPS figure was 2nd-highest of his career(.892 in 2008)...started 144 games at 2nd base and 10 as theDH...fanned once every 10.2 at bats, the 6th-best ratio in the A.L...his 77 RBI were the 2nd fewest ever by a Ranger with at least 30homers (Nelson Cruz, 33 HR, 76 RBI in 2009). Started 102 games at 2nd base while posting career lowsin most offensive categories due to 2 stints on the DL...had thehighest OBP (.382) and 2nd-highest batting average (.286) of anyML season ... had 3rd highest average on the club in Rangers Ballparkat .319 (59-185) ... batted career best .376 (35-93) vs. lefthanders,3rd highest in the majors among players with at least 100plate appearances vs. LHP and best in team history ... Texas went61-41 (.598) with him in the starting lineup, 29-31 (.483) in gameshe did not start ... had the best ratio of walks to strikeouts in his career,nearly more walks than K's (56 BB, 57 SO). Made a team high 143 starts, all at second base...ranked among the A.L. leaders in steals (7th, 31), runs (10th, 101), bunt hits(T10th, 5), and extra base hits (T12th, 67)... led Rangers in plate appearances (640), runs, extra-base hits, walks (59), and runs created(100), was second in homers (31), RBI (86), steals, total bases (276), and times on base (208), and tied for second in triples (4),hit by pitch (6), bunt hits, and multi-hit games (39)...set career highs for games (144) homers, RBI, steals, and total bases... had second-best at-bat/home run ratio on club at 18.26...missed on just 12.7% of his swings, best rate among Rangers...had 0.58 ratio ofground balls to fly balls, the second lowest figure in the majors...hit .310 (49-158) off lefties, .230 (94-408) vs. right-handers...hit .286 (82-287) in Arlington, .219 (61-279) on road...batted .304 (34-112) with runners in scoring position, and is a career .318 hitter in thatcapacity...had season high 4 RBI twice, in cycle game on April 15 vs. Baltimore and August 27 at New York (AL). A first-time All-Star in 2008, Kinsler ranked among league leaders inseveral categories at the time of his season-ending injury in August...batted.319 with 18 home runs, 41 doubles, 102 runs scored, and 71 RBI in 121games for Texas...despite missing almost the final month-and-a-half of theseason, established career highs in runs, doubles, triples (4), total bases(268), RBI, extra-base hits (63), and stolen bases (26)...had the highestaverage, on-base pct. (.375), and slugging mark (.517) of his 3-year bigleague career...finished with the 4th-highest qualifying average in the A.L.,and also ranked among league leaders in runs (T8th) and stolen bases(10th)...had the league's highest average against right-handed pitchers (.332) and also ranked among A.L. average leaders in daygames (4th, .346), at home (7th, .335), and at night (10th, .309)...batted .413 (45-109) with runners in scoring position, 2nd-highestin the majors behind only Kansas City's David DeJesus (.419)...Kinsler's .413 figure with RISP was a team record, one point betterthan Michael Young's .412 in 2006...for the year, ranked as the 10th-hardest player to strike out in the A.L., one strikeout every 8.7plate appearances, best figure among Rangers...despite his abrupt end to the season, he still led all Rangers in doubles, stolenbases, and sac hits...tied Michael Young for team lead in runs scored...also ranked among team leaders in total bases (2nd), runscreated (2nd), extra-base hits (2nd), sac flies (2nd, 7), triples (T2nd, 4), OPS (3rd, .892), hits (3rd), home runs (3rd), multi-hit games(3rd), walks (5th, 45), and RBI (5th)...ranked 5th among Rangers in go-ahead RBI (14) and game-winning RBI (6)...had 4 bunt hits,2nd-most among Rangers, and his 14 games of 3+ hits ranked 3rd on club...batted .281 (38-135) vs. lefties and .332 (127-383)against right-handers...hit .335 at home and .303 on the road...batted .346 (47-136) in day games...hit .375 (27-72) in Interleaguegames...hit .459 (28-61) when putting the first pitch of an at-bat into play...was 0-for-1 with a walk as a pinch-hitter. Led Rangers in runs (96), walks (62),and stolen bases (23), also ranking among team leaders in total bases(2nd, 213), home runs (T2nd, 20), hits (T2nd, 127), extra-base hits (3rd, 44), and RBI (5th, 61)...was one of 14 players in the majorsand 5 in the A.L. with at least 20 homers and 20 steals...started 129 games at second base...hit in 6 different spots in the battingorder with high of 48 games in the second position...was named A.L. Player of the Week for April 9-15, leading league in average(.476), home runs (4), and slugging (1.095)...had a season-high 10-game hit streak August 25-Sept. 4. He started 84 of the Rangers' last 85 games at second base. He had an 11-game hitting streak in September, longest by a Rangers rookie since 2003. He hit 27 doubles, seventh most among major league rookies and third most by a rookie in club history. He was the first rookie in club history with at least 100 hits, 10 home runs and 10 stolen bases in a season. He was the sixth AL rookie since 2000 with 10 HR and 10 SB. He was one of only 12 Texas players to hit 10 HR in their rookie season and one of only 13 to record 100 hits. His 14 home runs ranks 10th in rookie club history. Joined Oddibe McDowell (1985, 18 HR, 25 SB) and Bob Brower (1987, 14 HR, 15 SB) as rookies in club history to hit 10 HR and record 10 stolen bases. Among AL rookies with 200-or-more at-bats, ranks 4th in batting average and first with 27 doubles; 2nd with 11 stolen bases and 3rd with 32 multi-hit games. Made his Triple-A debut, spending the entire season at Oklahoma (AAA)...ranked T10th among all minor leaguers with 102 runsscored...ranked among Texas minor leaguers in home runs (2nd, 23), runs (2nd), RBI (T2nd, 94), doubles (T7th, 28), hits (8th, 145),walks (T8th, 53) and stolen bases (10th, 19)...rated as the Rangers' 6th-best prospect by Baseball America following the season. Summary: Ranked among Pacific Coast League leaders in at-bats (T2nd, 530) and runs scored (5th)...batted .274 (145-530) in 131games...started the season in a 7-37 (.189) slump over first 9 games through April 16...hit .394 (13-33) over next 8 games to raiseaverage to .286...batted .160 (12-75) over next 19 games from April 26-May 17, to lower average to .221...hit .329 (57-173) over next43 games from May 19-July 7 to raise average from .221 to .280...stretch included season-high 13-game hit streak from May 22-June 7 at .400 (20-50)...endured an 0-21 slump from July 8-15 and went 14-85 (.165) over 21 games from July 8-August 2 to loweraverage to .256...batted .331 (42-127) over final 31 games, beginning August 4, to finish the season at .272...recorded season-high5 hits on August 25 at Omaha...fell a double short of the cycle in that contest, going 5-6 with a triple, homer and 4 RBI...recorded 4or more RBI on 7 occasions...posted season-highs with 2 HR and 5 RBI on June 14 vs. Omaha, his lone 2-homer contest in2005...homered in consecutive games on April 24-25 at Albuquerque, July 6-7 at Albuquerque and August 28 at Omaha and August29 vs. New Orleans...doubled in 4 consecutive contests from April 21-25 and August 9-12...recorded 37 multi-hit contests, including5 straight from August 8-12...recorded 3 or more hits in 16 contests...scored multiple runs on 22 occasions, including season-high 3runs in 4 contests...plated a run in 12 consecutive games from May 23-June 7...also scored in 9 straight contests from August 27-September 4...hit .303 (105-347) in 85 games in the 2nd spot of the batting order...batted .308 (48-156) with runners in scoring positionand .324 (23-71) with RISP and 2 outs. 2005 Notes: Named Rangers Minor League Player of the Month for August, batting .336 (37-110) with 5 HR and 20 RBI in 27 gamesduring the month...selected as a Pacific Coast League All-Star, going 1-2 in the Triple-A All-Star Game as a reserve at secondbase...participated in the home run derby, finishing 2nd to Columbus' Mitch Jones...appeared in 126 games at second base, threeat shortstop and one at third base...recorded a .972 (20 E/709 TC) fielding percentage at second base...had never appeared in aprofessional game at second base prior to the 2005 season...led all PCL second basemen in total chances (709), putouts (276),assists (413), double plays (112) and errors (20) at the position...appeared in all 5 postseason games for the RedHawks, batting .222(4-18) with 4 walks and a double...went to major league spring training as a non-roster invitee...batted .327 (16-49) with 8 doubles,2 home runs and 9 RBI in 28 spring games with Texas...ranked 2nd on the Rangers and T5th in the AL in doubles in springtraining...added to Rangers' 40-man roster for the first time on November 18, 2005. Named the Texas Rangers TomGrieve Minor League Player of the Year... named to Baseball America's midseason and postseason All-Star teams at shortstop...splitseason between Clinton (A) and Frisco (AA), hitting .345 (173-501) with 20 home runs, 51 doubles, 103 runs scored and 98 RBI in130 total games...topped Rangers organization in RBI, extra-base hits (71), on-base percentage (.428), slugging (.568), total bases(281) and hit by pitches (18)...tied for the overall minor league lead in doubles, matching the Rangers' all-time minor league record(Mike Lamb, 1999)...also ranked among system leaders in average (2nd), at-bats (4th), home runs (T4th), and stolen bases (5th,23)...had the sixth-highest average in all of minor league baseball among qualifying players...was leading Midwest League in average(.402), hits (90), doubles (30), RBI (52), on-base percentage (.465), slugging (.692), extra-base hits (42), and runs scored (52)at time of promotion to Frisco on June 13...named to league's midseason and postseason All-Star rosters... named Texas League batter of the week for June 14-20, his first full week in Double-A...homered off Andy Pettitte, on rehab assignment for Houston at thetime, June 18 at Round Rock...was named Rangers minor league player of the month, in April and June...batted .306 (33-108) with9 doubles, 4 HR, 16 RBI and 20 runs scored in 27 games for the Peoria Saguaros of the Arizona Fall League. Made pro debutwith Spokane (short season A)...led the club in triples (6) and stolen bases (11)...went 3-for-4 with 2 steals in first pro game vs. Boiseon July 3...played in all 3 postseason games for the Northwest League champs. 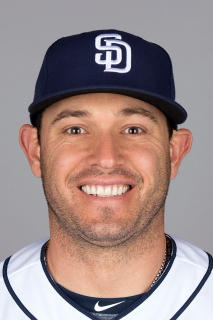 December 20, 2018 San Diego Padres signed free agent 2B Ian Kinsler. October 29, 2018 2B Ian Kinsler elected free agency. August 17, 2018 Boston Red Sox activated 2B Ian Kinsler from the 10-day disabled list. August 4, 2018 Boston Red Sox placed 2B Ian Kinsler on the 10-day disabled list. Left hamstring strain. July 31, 2018 Los Angeles Angels traded 2B Ian Kinsler and cash to Boston Red Sox for RHP Ty Buttrey and LHP Williams Jerez. April 12, 2018 Los Angeles Angels activated 2B Ian Kinsler from the 10-day disabled list. March 31, 2018 Los Angeles Angels placed 2B Ian Kinsler on the 10-day disabled list. Left abductor strain. June 6, 2017 Detroit Tigers activated 2B Ian Kinsler from the 10-day disabled list. May 27, 2017 Detroit Tigers placed 2B Ian Kinsler on the 10-day disabled list. Left hamstring strain. November 20, 2013 Texas Rangers traded 2B Ian Kinsler to Detroit Tigers for cash and 1B Prince Fielder. June 15, 2013 Ian Kinsler roster status changed by Texas Rangers. June 13, 2013 Texas Rangers sent 2B Ian Kinsler on a rehab assignment to Frisco RoughRiders. May 19, 2013 Texas Rangers placed 2B Ian Kinsler on the 15-day disabled list retroactive to May 18, 2013. Right intercostal strain. June 11, 2011 Texas Rangers activated 2B Ian Kinsler from the paternity list. September 1, 2010 Texas Rangers activated 2B Ian Kinsler from the 15-day disabled list. August 31, 2010 Frisco RoughRiders sent 2B Ian Kinsler on a rehab assignment to Oklahoma City RedHawks. August 28, 2010 sent 2B Ian Kinsler on a rehab assignment to Frisco RoughRiders. July 29, 2010 Texas Rangers placed 2B Ian Kinsler on the 15-day disabled list retroactive to July 28, 2010. Left groin strain. April 30, 2010 Texas Rangers activated 2B Ian Kinsler from the 15-day disabled list. April 26, 2010 sent 2B Ian Kinsler on a rehab assignment to Frisco RoughRiders. April 4, 2010 Texas Rangers placed 2B Ian Kinsler on the 15-day disabled list retroactive to March 26, 2010. Sprained right ankle. August 12, 2009 Texas Rangers sent 2B Ian Kinsler on a rehab assignment to Frisco RoughRiders. August 2, 2009 Ian Kinsler roster status changed by Texas Rangers.